The Ada Lovelace team, from the Wabash Valley of Terre Haute, Ind., won the 17th annual Greater St. Louis Botball Tournament held Saturday, April 13 in the activity gym at the Southern Illinois University Edwardsville Student Fitness Center. Greenville (Ill.) High School was runner-up with Edwardsville High School finishing third in the nine-team field. This year’s theme was medical response to fires, and the specific tasks involved locating injured individuals, represented by cubes, and bringing them to toy ambulances. The teams were equipped with hundreds of parts such as sensors, motors and structural pieces. Students were free to be as inventive with the components as possible. The game board was set on an 8’ x 8’ table, with various PVC and material components. The result was a fleet of unique robots that allowed the students to see the strengths and weaknesses of different approaches in head-to-head competition. Points were awarded for a variety of tasks, and teams had to decide which to focus upon. “When building the bot, teams had to figure out whether they wanted to do a complex, high-scoring action and hope not to fail, or do a variety of small, low-scoring maneuvers and hope their aggregate would be enough,” Wilson said. “Judges also randomized the field for each match so for instance, the teams knew that one of the cardboard buildings in the field was on fire, but not which one. View the final standings at scores.botball.org. Members of SIUE’s Autonomous Robotics Club (ARC) student organization volunteered their time to help. 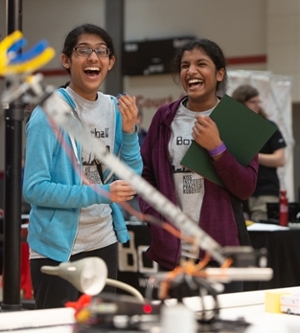 Photo (L-R): Victorious Ada Lovelace team members Alisha Mastakar and Sara Zachariah from Terre Haute, Ind., at the 17th annual Greater St. Louis Botball Tournament at SIUE.